Quad Canes are ideal for people who are independent enough to use a one-hand walking aid, but still need the stability that four points of floor contact can provide. 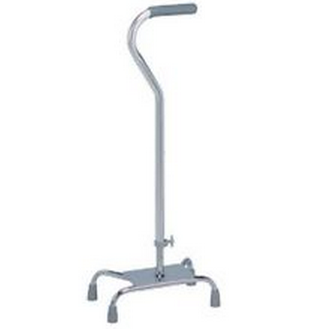 This Carex Quad Cane is adaptable for right- or left-hand use. Manufactured by Carex, this Quad Cane has a low center of gravity for increased stability and balance. An Offset Handle provides additional balance because the hand rests directly over the shaft of the cane. The small base size model can be used on stairs, while the large base size model offers increased support. Quad Cane Product Numbers: A740C0, A758C0. Size Options: Small and Large. Base Size: 8 x 12 inch. Four contact points for greater stability. Carex Quad Cane Warranty: Limited Lifetime. Quad Cane Usage Instructions offers detailed info for proper cane use, cane adjustment and maintenance information. Carex Cane Guidelines provides information on how to use awalking cane, negotiating stairs with a cane, potential cane safety hazards, cane care and maintenance and HCPCS codes for Medicare reimbursement. Can this cane be used in a clean room setting? We wear smock,white hair bluffing,booties, and gloves.